I precaffeinated to get ready for the fan club presale. At exactly 10:00 (I had the official time up in another window) the presale seats came available. I missed one click on the confirmation page-- got my code, went to my open ticketmaster page, plopped it in after restarting that one- signed up for 4 tickets, and then saw something like 'AA' and I thought WHOOHOO FLOOR SEATS!!! Actually they were section 104 (first level towards the back). It all took me about one minute, I spent a third of a month's income, and I got what I would call cruddy seats. Oh well. If they open another Denver date I'll be even poorer. got floor seats, closer than mine. So much for any fan club benefits. Did you go through THE POLICETOUR member club? "Is any body alive in here?" I did-- the ONLY REASON I signed up was for better seats/early access. I'm not too keen on memorabilia. I was intending to sign up through them as well until I started reading some bad feedback when the ticket sales first began. Then I was informed about the bestbuy rewards program and luckily I was a member already. I'm glad I saved my $100. I will try my luck tomorrow for Detroit presale with BBR and see what I get or not get. Got my tickets this morning through bestbuy rewards presale and am pretty darn happy with the result. I'm incline to say they are and will be above and beyond better than what people will get through thepolicetour membership. Just my opinion, of course. There's another Denver show. My friend apparently won the lottery and was first in line for his floor seats, which are still better than my presale seats. I have to teach during the sale-- AIYAH!!! Do you have another friend who might be willing to log into your account and buy tix? 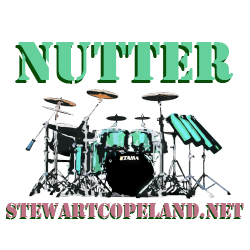 On Google - site:stewartcopeland.net "your keyword here" - thanks DM!! Hi DiveMistress- I think you mean for the presale-- if so, I was under the impression that I've used my code and can't receive another one. I'll be out of class at 10 so I can click away when they go on sale. I can't go get in line and get my lottery number. CHEERS! Whaaat? They have a lottery before they'll even let you stand in line? be able to get in via computer anyhow. I once stayed up all night outside of a stadium to get R.E.M. tickets. went up to buy the tickets- and only got two for the three of us. You're going to die laughing but I helped some friends camp out to get tix for Star Wars Episode 1, at the Uptown Theater in Wash D.C. It was a blast, actually, although if I'd known about Jar-Jar I probably would have restrained myself. Honestly? There just aren't that many bands I'd camp out to see nowadays anyway. Well, I take it back - there are plenty of bands I'd camp out to see (Jorge Ben, Nick Lowe, Neko Case, Mike Doughty, Iggy Pop, Mike Watt, Oysterhead, Paul Kelly) but as my tastes run to artists not played on commercial radio, it's usually not required. And it's too bad, because if there were any justice in this world Britney Spears would be a chambermaid and Neko Case would own her own Learjet. But I'm not queen of the universe, unfortunately. I do see what you're saying, though...there's a tradition being lost here in the days of instant global telecommunications. I have the feeling that's what's leading to the rise of scalping, as well. Don't tell me these pimps and hustlers trying to part schoolkids from their lunch money would sit out all night in the rain for a glimpse of some beloved recording artist. [quote="Divemistress of the Dark"]Whaaat? They have a lottery before they'll even let you stand in line? You might be better off.